Sen. Tim Scott, the lone African-American in the Senate GOP ranks, is the latest Republican to rebuke Iowa Congressman Steve King, after the eight-term GOP representative, in an interview with the New York Times earlier this week, questioned why the terms “white nationalism” and “white supremacy” are considered offensive in modern America. Those comments, coupled with King’s long history of controversial comments about race and immigration, have led several prominent Republicans to rebuke King and call for a primary challenge to him in 2020. 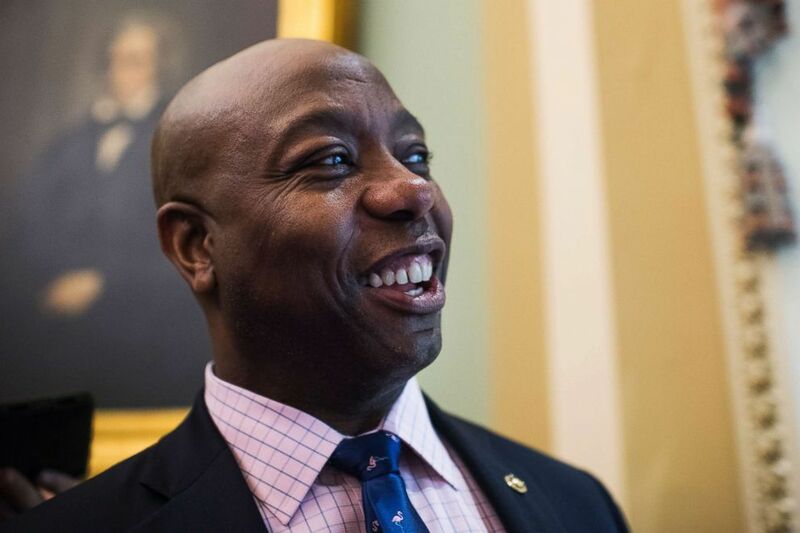 Sen. Tim Scott talks with reporters as the Senate takes a procedural vote on the spending bill, Dec. 21, 2018, in Washington, D.C.
“I will admit I am unsure who is offended by the term ‘Western civilization’ on its own, but anyone who needs ‘white nationalist’ or ‘white supremacist’ defined, described and defended does lack some pretty common knowledge,” Scott wrote. Other top Republicans, from House Minority Leader Kevin McCarthy, R-Calif., and House Republican Conference Chair Liz Cheney, R-Wyo., have also leveled harsh criticism of King. Former GOP presidential candidate Jeb Bush weighed in on Twitter as well, calling on party leaders to help defeat King. Those looking for a significant primary challenge to King may find hope in Iowa state Sen. Randy Feenstra, who announced earlier this week that he is taking steps to run against the incumbent in the GOP primary next year. King responded to the news of Feenstra’s candidacy by calling it, “misguided political opportunism, fueled by establishment puppeteers,” in a statement released Wednesday afternoon.